Just taking a break from our normally scheduled blog posts and bringing you over to our other job! Instagram is where it's at! It has fast become a popular social media platform for bloggers, influencers, small business owners and Etsy shop owners. Today I want to share with you some of the things I have learned along the way about Instagram as a social media platform and what has worked for us! Utilize the power of editing apps. Instagram has lots of filter options and editing options but if you want to up your game even more then we highly recommend using editing apps! You need to be active and engage! You cannot just post and disappear. You need to comment, like, and follow. You also need go find your target audience! Now I understand there is so much to learn out there about so many social media platforms. But Instagram as a social media platform should really be a key piece in your strategy to grow your business, blog, income etc. 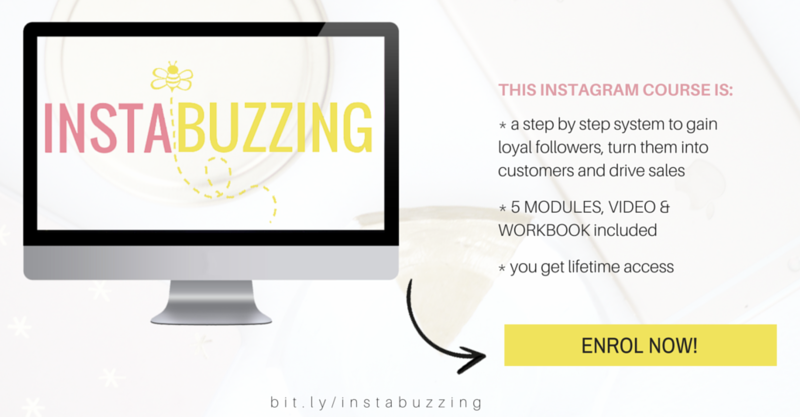 Check out the Instagram Course we have launched: Instabuzzing! Along with this blog we run a business called Buzzing Creatives, where we help creative entrepreneurs like yourself grow their business online by leveraging their online presence. Tired of trying to grow your Instagram and barely seeing the number of followers change? Tired of all your followers being just your peers and not your ideal customers? Tired of not being able to find your target audience? Not sure how to use Instagram to grow your sales? Then INSTABUZZING is for you! With INSTABUZZING you will learn how to make your Instagram work for you and your business. Because with the right strategies in place Instagram can be the key to growing your business as a creative entrepreneur! Have a killer Instagram feed that is cohesive and consistent with amazing visual content, making YOU that Instagram account everyone wants to follow! So what are you waiting for? Get your Instagram Buzzing with Instabuzzing and see your followers, traffic, and sales go up! if you have any questions regarding the course, feel free to email us at footnotesandfinds@gmail.com with the subject line: "instabuzzing question"
Great tips, and all SO true!! Instagram posting/growth is a job in itself, some people don't realize the work that goes into it!